1962 October 1: Carter tells Rosalynn he plans to run for the state senate. October 16: Carter loses the primary by 139 votes to Homer Moore, and decides to ask for a recount. November 2: A recount committee rules in Carter's favor and orders a new election, which Carter will win by 831 votes four days later. January 14: The General Assembly session opens in Atlanta. Jimmy Carter is sworn in as state senator. Jimmy Carter started his career by serving on various local boards, governing such entities as the schools, hospitals, and libraries, among others. In the 1960s, he served two terms in the Georgia Senate from the fourteenth district of Georgia. His 1961 election to the state Senate, which followed the end of Georgia's County Unit System (per the Supreme Court case of Gray v. Sanders), was chronicled in his book Turning Point: A Candidate, a State, and a Nation Come of Age. The election involved corruption led by Joe Hurst, the sheriff of Quitman County; system abuses included votes from deceased persons and tallies filled with people who supposedly voted in alphabetical order. It took a challenge of the fraudulent results for Carter to win the election. Carter was reelected in 1964, to serve a second two-year term. For a time in State Senate he chaired its Education Committee. 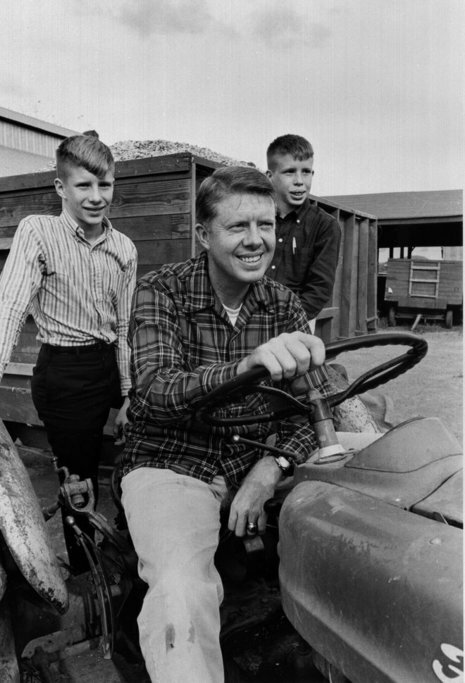 In 1966, Carter declined running for re-election as a state senator to pursue a gubernatorial run. His first cousin, Hugh Carter, was elected as a Democrat and took over his seat in the Senate.